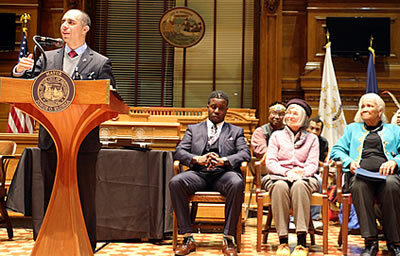 Mayor Jorge O. Elorza today joined with City Council President Luis A. Aponte and other Councilors, community and faith leaders to induct Kobi Dennis, Eugenia Marks and Barbara Thurman into the City’s Reverend Dr. Martin Luther King, Jr. Hall of Fame. The MLK Hall of Fame recognizes individuals who carry on the legacy of the late Reverend Dr. Martin Luther King Jr. within the community. Inductees have made substantial contributions to acceptance, social justice, civil rights and equality in the City of Providence. Kobi Dennis is the founder of Project Night Vision, a partnership between the City of Providence and Providence College aimed at providing at-risk teenage youth with a safe and active learning environment through athletics, team building and community service. Eugenia Marks is the Senior Director of Policy for the Audubon Society of Rhode Island, an organization which protects over 9,500 acres of woodlands and costal properties in Rhode Island through education, land conservation and advocacy. Barbara Thurman is a long-time resident of Wiggins Village whose history of activism extends back to the 1960s and includes work supporting affordable housing and tenants’ rights in the City of Providence and the State of Rhode Island. This evening’s celebration included remarks from Mayor Elorza, City Council President Aponte, Rev. Jeffrey Williams, and Ray Watson, Acting Chair of the Human Relations Commission. The ceremony also includes performances by the Knights Cathedral Choir, Eastern Medicine Singers and Classical High School Student Ashley Soto who will sing the National Anthem.